There are countless piano apps on the App Store, but none can match iGrand Piano's quality, variety and professional features. iGrand Piano is the first concert-quality piano app, offering up to 40 gorgeous sounding, true-stereo, multisampled pianos, with fidelity that rivals the best professional piano instruments for Mac and PC. With iGrand Piano, you'll feel like you're playing a real piano. But that’s only part of the story. iGrand Piano also provides you with a full suite of MIDI-controllable adjustable parameters, allowing you to tailor the sound of a particular piano to just the way you want it. And if that’s not enough, you also get a built-in recorder that features an audio/visual metronome — you can even export your recordings as WAV or M4a files. 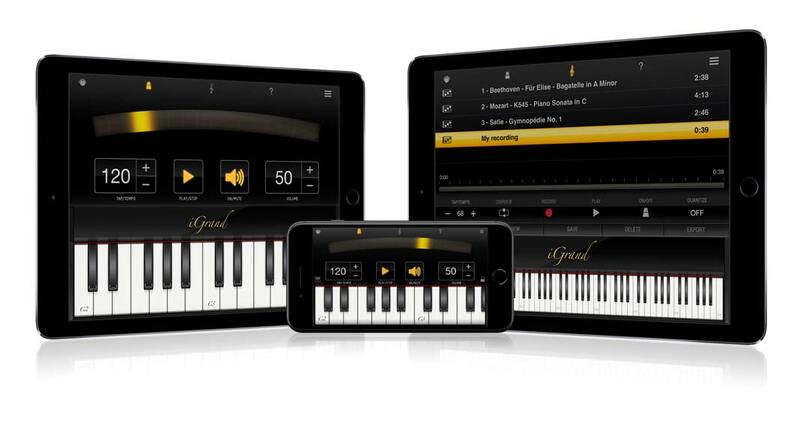 Coupled with one of IK’s iOS keyboards, MIDI interfaces or other MIDI-compatible devices, iGrand Piano becomes a killer ultra-portable mobile setup that lets you make professional-quality music anytime and everywhere. The collection of sampled pianos in iGrand Piano provides a huge range of sonic choices. They include Grand Piano 1, Classical Piano 1, Jazz Piano 1, Rock Piano 1, Octave Piano, Rich Upright, Rock Upright, Soft Upright, Baby Grand, Bright Baby Grand, Pop Baby Grand, Classical Baby Grand, Grand Piano 2, Mellow Grand 2, Rock Piano 2, Saloon Piano, Grammophone Upright, Jazz Upright, Hollywood Piano 1, Hollywood Piano 2, Hollywood Piano FX, Piano and Strings 1, Piano and Strings 2, Piano and Strings FX, 7' Grand Piano, 7' Grand Piano CH, 7' Grand Piano FL, 7' Grand Piano PH, Alt Rock Upright, Deep Chorus Upright, Bright Pop Grand, Chorused Pop Grand, Real Tack Piano, Saloon Tack Piano, Harpsichord 8', Harpsichord 8' Delicate, Harpsichord 8' Chorus, Harpsichord 8' Spacey, 2-Octave Harpsichord 1 and 2-Octave Harpsichord 2. All instruments in iGrand Piano have been meticulously sampled in high-definition across multiple velocities. Play a low note on iGrand Piano and you’ll hear its fullness and natural decay. Play a note in the middle of the keyboard and listen to its warmth and richness. Play a high note and notice the realistic change in timbre as you get into the higher octaves. 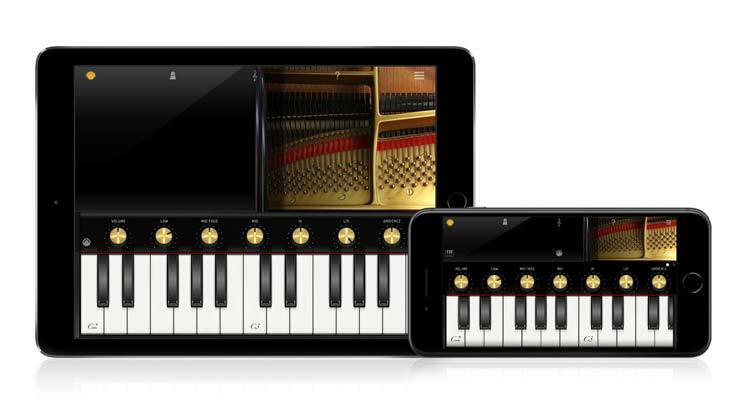 No other piano app offers anywhere near the same level of sonic detail. Seven pianos are included with the purchase of iGrand Piano, and an additional one is unlocked when you register your app. 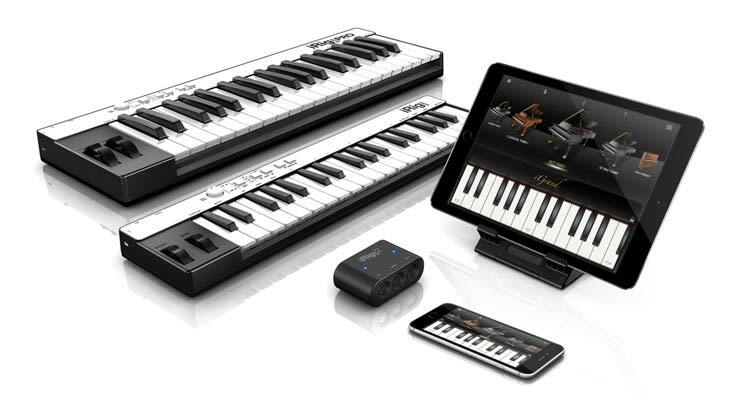 Another bonus piano is made available when you register an iRig Pro, iRig Keys Pro, iRig Keys or iRig MIDI 2 hardware. 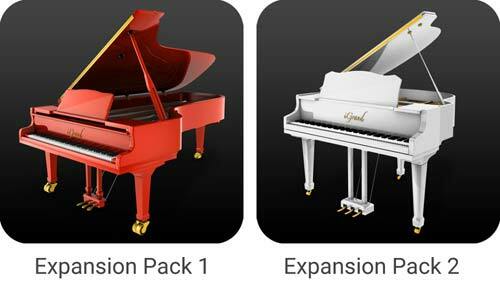 In addition to the base instruments included in iGrand Piano, you can also expand your sonic reach with sound packs that introduce a whole new spectrum of playing: Try Piano Expansion Pack 1 to introduce 9 additional instruments or Piano Expansion Pack 2 to unlock 22 extra instruments. That makes for 40 sounds in total! A free version of iGrand Piano is also available. It gives you one piano (another one can be unlocked when you register your app), that's limited to 49 notes. You can upgrade to the full version from this free version or even jump straight into the full collection. As great as the instruments in iGrand Piano sound, there will be times that you want to adjust them to suit a particular song or situation. Tap the control-knob icon in the upper left-hand corner, and you’ll see seven virtual knobs running across the top of the keyboard. Ambience: Lets you change the amount of ambience, from dry to very "roomy"
All the knobs can be assigned to MIDI controllers for external adjustments. It’s as easy as pressing the MIDI icon to the right of the parameter knobs, holding the parameter you want to assign until it highlights, and then moving the external MIDI knob that you want to control it with. iGrand Piano also supports MIDI Program Change commands and Virtual MIDI. In addition, iGrand Piano now features a variations system that lets you save your tonal adjustments to one of four conveniently placed buttons that sit just next to the knobs themselves. The recorder built into iGrand Piano lets you capture your rehearsals or performances with ease. Select a tempo on the metronome, which has a large visual display along with its audio click, or use the Tap Tempo feature. Hit the record button, and play your part. Use the Overdub button to layer as many parts as you’d like on top of it. You can even quantize your recording to even out rhythmic inconsistencies. Once you’re happy with your recording, iGrand Piano lets you export it as a WAV or M4a file using a variety of methods. You can email it, share it with iTunes File Sharing, or use the copy feature. iGrand Piano offers a very natural playing experience thanks to its realistic sounds, which respond like the notes on an actual piano. The realism is aided by the app’s extremely low latency, when set to the Ultra Low latency setting, which makes the delay between when you hit the note and when hear it virtually unnoticeable. If you want to save processor resources, you can change to the Low latency setting, via the drop-down Settings menu. From that menu you can also adjust the playing feel by altering the Velocity Curve from hard to soft (100 steps). Within settings you can also set the MIDI channel and turn on and off features like Program Change, MIDI Controllers and Key Labels, among others. With iGrand Piano you're in complete control. And while you can use the onboard touchscreen keyboard to play your sounds, the real fun starts when you explore IK's world of external input options. Keyboard player? Try it with iRig Keys with Lightning or iRig Keys Pro, two compact and portable 3-octave keyboards that you can use while on the go. Want versatility? Use an iRig MIDI 2 interface to connect any MIDI-compatible keyboard or external controller. 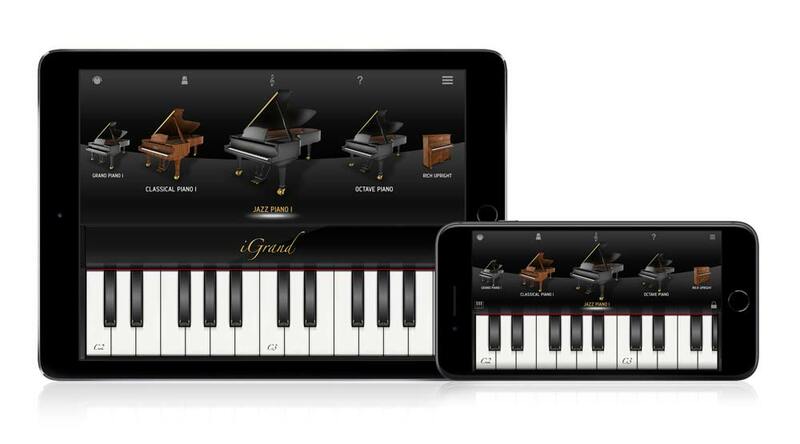 iGrand Piano is also compatible with Inter-App Audio and Audiobus (a third-party app that requires separate purchase) in iOS 8 and above. That means you can send its output through other audio apps — like AmpliTube, GarageBand and many others — to be filtered, recorded, looped and more. The ability to share audio between apps opens up the potential for incredibly creative possibilities. iGrand Piano also supports background audio, which means it can play in the background when other audio apps are playing in the foreground. This allows for even more layering opportunities and the potential for extremely unique audio combinations. Download iGrand Piano today to experience what its world of sounds inspires in you. iGrand Piano™, iRig® MIDI, and iRig® KEYS are trademarks or registered trademarks property of IK Multimedia Production Srl. All other product names and images, trademarks and artists names are the property of their respective owners, which are in no way associated or affiliated with IK Multimedia. iPhone®, iPod touch®, iPad®, GarageBand®, Mac and the Mac logo are trademarks of Apple Computer, Inc., registered in the U.S. and other countries. App Store is a service mark of Apple Inc. Samsung, GALAXY Note® 4, GALAXY Note® Edge, GALAXY S6, GALAXY S6 Edge and GALAXY S5 are all trademarks of Samsung Electronics Co. Android is a trademark of Google Inc. Google Play is a trademark of Google Inc.